Transvascular Aortic Valve Replacement (TAVR) has emerged as a treatment option in patients with severe aortic stenosis who are inoperable and has recently been evaluated in patients with intermediate surgical risk. The number of procedures is increasing worldwide in parallel with the demographic changes in industrial countries. The risk for cerebral embolism is of main concern and represents a major determinant for prognosis and quality of live after TAVR. The empiric antithrombotic therapy consists of Dual Antiplatelet Therapy (DAPT); However the risk-benefit of this approach is lacking evidence from randomized, placebo-controlled trials regarding choice and duration of antithrombotic treatment. Although anticoagulation is generally not recommended in patients with aortic bioprosthesis without atrial fibrillation, there is current uncertainty whether combination of antiplatelet and anticoagulant therapy or anticoagulation alone might represent a more favorable antithrombotic regimen compared to the current empiric standard of DAPT. In addition, so far undetected atrial fibrillation is highly prevalent in the elderly population undergoing TAVR. In particular, the favorable safety profile of Non-Vitamin K Oral Anticoagulants (NOAC) offers an attractive option. 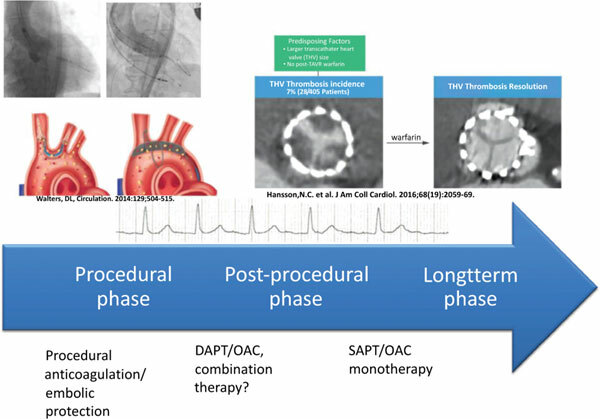 A number of trials are currently underway to investigate the benefit of NOAC in patients with and without atrial fibrillation undergoing TAVR. The present article reviews the available evidence concerning stroke risk in TAVR patients and the current and future role of antithrombotic therapy during and after the procedure. Keywords: Antithrombotic Therapy, TAVR, DAPT, NOAC, stroke, SVT. Keywords:Antithrombotic Therapy, TAVR, DAPT, NOAC, stroke, SVT. Abstract:Transvascular Aortic Valve Replacement (TAVR) has emerged as a treatment option in patients with severe aortic stenosis who are inoperable and has recently been evaluated in patients with intermediate surgical risk. The number of procedures is increasing worldwide in parallel with the demographic changes in industrial countries. The risk for cerebral embolism is of main concern and represents a major determinant for prognosis and quality of live after TAVR. The empiric antithrombotic therapy consists of Dual Antiplatelet Therapy (DAPT); However the risk-benefit of this approach is lacking evidence from randomized, placebo-controlled trials regarding choice and duration of antithrombotic treatment. Although anticoagulation is generally not recommended in patients with aortic bioprosthesis without atrial fibrillation, there is current uncertainty whether combination of antiplatelet and anticoagulant therapy or anticoagulation alone might represent a more favorable antithrombotic regimen compared to the current empiric standard of DAPT. In addition, so far undetected atrial fibrillation is highly prevalent in the elderly population undergoing TAVR. In particular, the favorable safety profile of Non-Vitamin K Oral Anticoagulants (NOAC) offers an attractive option. A number of trials are currently underway to investigate the benefit of NOAC in patients with and without atrial fibrillation undergoing TAVR. The present article reviews the available evidence concerning stroke risk in TAVR patients and the current and future role of antithrombotic therapy during and after the procedure. Role of Carbon Monoxide in Kidney Function: Is a little Carbon Monoxide Good for the Kidney? What Genetics Tells us about Cardiovascular Disease in Diabetic Patients? NOAC or warfarin for Atrial Fibrillation: does time in therapeutic range matter?